A quick comparison image today, of this simple rose I drew. Sometimes when you are coloring flowers with deep petals, like a rose, it comes out too flat. To make the tips of the petals need to look like they are standing out, the key is contrast and a wider range of colors. Today I'll be coloring this quick rose drawing I made for the tutorial. The lighting is kinda generic, being from the front & above, so neither side will have stronger shadows. Here is the first example. I colored the leaves with YG11, then added YG17 to darken the shading, then went back with the YG11 to blend. 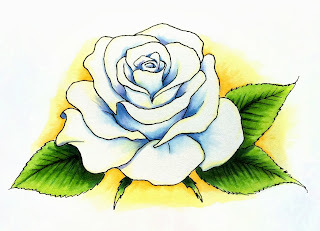 The white petals I shaded with B41, as I wanted a very cool-feeling white rose (many white roses have a hint of pale yellow or pink). To make the blue shadows feel even more blue, I put the compliment of blue in the background- orange. Not a strong orange, but YR21, blended with Y11. This isn't bad, but it is very limited in depth. Sure, I went petal by petal, and added shadows that are appropriate, but it still lacks punch. So, I started over and spent more time being careful. First, I worked on the leaves. Instead of two colors in the same natural blending group, I threw in extra colors. I used a base of YG11 again, but I added some Y11 over the tips to warm it up even more. Then, in the shadows, I added YG17 in streaks following the veins on the leaves. I tried to not go back and blend, as I wanted to keep the veins visible. Next, I added G28 and G99 in the shadows, as both of those greens are grayer and cooler than the YG families. For good measure, I also really cooled the shadows down by adding hints of B37. You can't see it, but it's there. Now the leaves look a lot more dynamic. For the petals, again, I started with the B41 that I used above, only, this time, I bended it out a little with the colorless blender. I also added extra deep shadows with BV02 and B45. I was careful to leave plenty of white. Note how my shadows are dense at the base of each petal, be it the topside or the underside of each petal. The tips are left as white as I could. To make the tips look warmer, yet curled, I pulled in hints of Y00 on either side of where I wanted the highlights to be brightest. Remember, warm colors feel closer, and cooler colors are good for shadows. Last, I threw in a simple background of YR21 and Y00. On my paper it almost looks neon, but scanned in it loses a lot of vibrancy. What I want you to take away from this tutorial is that you shouldn't color an image just once. Try it multiple times, and push yourself to add more contrast or add unusual colors into the highlights or shadows. Try coloring the rose with yellow tones and having the sky in blues. Or, if it was a red rose, make the background the compliment (pale green). Have a great week coloring!! Whew! 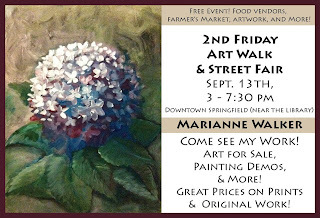 Fall has started around here, and with it comes a few local events that I am participating in. 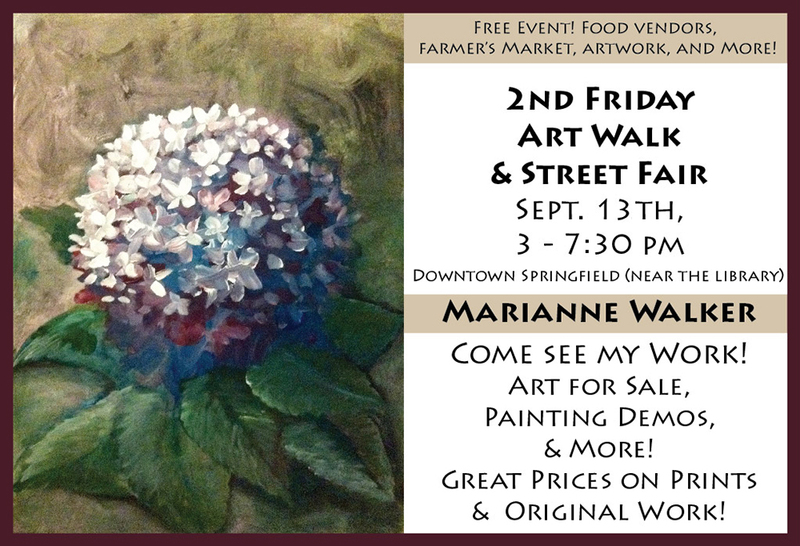 Tomorrow, join me at the Springfield, OR, 2nd Friday Art Walk from 3 to about 7:30pm. I'll be mostly painting, but I'll have some markers there as well. I'll have original paintings and prints of my favorite Copic illustrations for sale. I will be at the annual Tools of the Trade Show, downstairs next to the marker display, demoing Copic markers and coloring whatever fun things come to mind. Stop by and ask me questions, learn techniques, and get a great price on all your favorite art supplies during their awesome sale. I hope to see you in person at one of these events! Have you taken one of our fun and messy Color & Ink workshops yet? We still have space in the last three sessions for 2013! Classes and projects will get switched up for 2014, so register now for this year's awesome projects! Are you a professor at an art school? Do you use Copics in your classes? Did you know you can request official demos? We have a sponsorship request form on our website. Check it out to see if your class can qualify! I was doing some research this week on colors, and realized NY Fashion Week is going on now! They released a nice chart and write-up on the 2014 Spring Fashion colors, and I love color charts. I went through the effort of matching the Spring 2014 Pantone® colors to the closest Copic colors and whipped up this fun graphic and illustration. Enjoy! 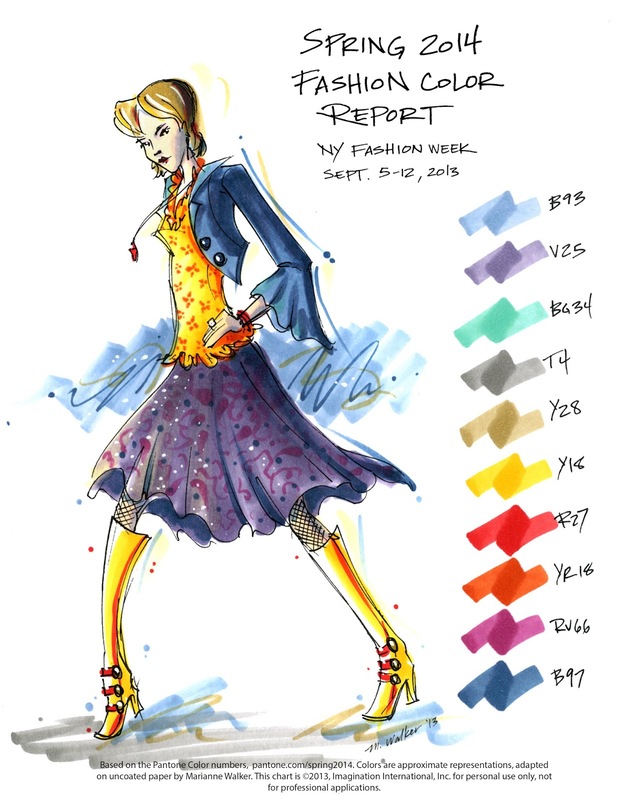 If you also want the full color report for Spring 2014 and to know how they choose colors, you can download it here. This week, if you wander over to the Hero Arts blog you will find a simple and fun airbrushing video I made for Halloween using the new Hero Arts Fall 2013 stamps and stencils. Leave a comment for a chance to win an autographed book, markers and refill inks, and a $50 gift certificate from Hero Arts! Then, once you've commented on the Hero Arts site, go and leave a comment on the Copic Blog for ANOTHER chance to win!! 2 sites, two prize packs...twice the giveaway fun! !